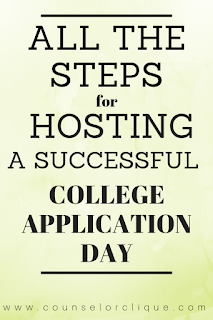 After I posted a picture of my College Application Day "exit ticket," I got numerous comments and direct messages about tips for holding such an event! We've done this event for about the past 6 years (?) and figured a lot out along the way of what works for us and what doesn't... so, before you implement, know that your event will get better and better each year you do it. 1- Reserve a place to hold your event like your school library. Reserve Chromebooks or computers or a lab if your school uses a process like that. In PowerPoint, I had these slides set with a transition (Transitions > Fade added to each slide) between each one. I also set 30 seconds per slide before rotation to the next one, and I applied this to all slides. Under "Slideshow" then "Set Up Slide Show," I set it to loop continuously. If there isn't a computer hook up, use a dry erase board. You will get a lot of the same questions, so it's nice to have somewhere to direct students to look, take notes, or take a picture of. 3- You may have noticed the fee waiver codes above. Our state has an initiative where they give out some waiver application codes for a while. If yours doesn't, you could always do some groundwork and see if you could get this up and running. If not, create a list of schools that are ALWAYS free. This is SO helpful in giving students a place to START. 4- Print out copies of all seniors' transcripts. 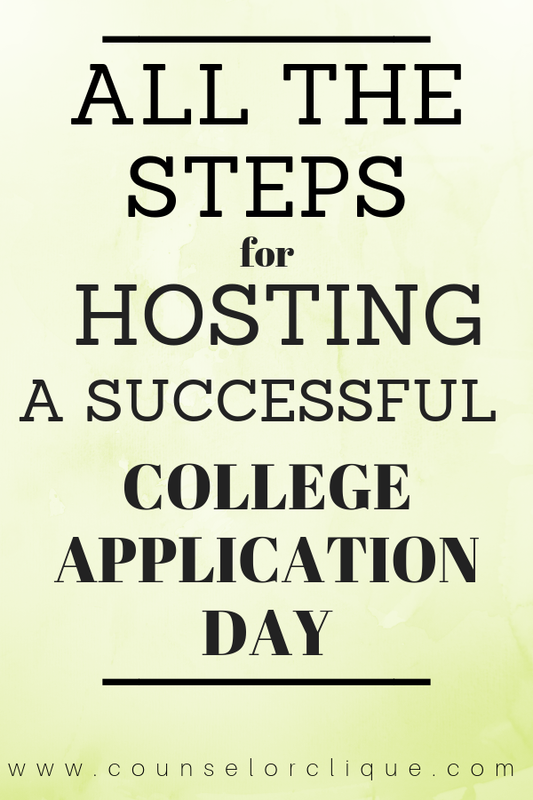 As they're applying, it is very helpful for them to have their GPA, class rank, etc. right at their fingertips... and it never hurts for them to have yet another copy of their transcript. 5- Use a sign up like "Sign Up Genius" to create time slots. We do 45-minute time slots and advertise the heck out of the sign up link. Once you have a cut off date, I recommend the free Sign Up Genius trial that locks any more sign-ups. Once you have your students signed up, you can download a spreadsheet with all of your information. 6- I use these time slots and names and put them in a Google sheet and share live with all teachers. I had a different tab for each time slot. That way, if students were added later, it was live for teachers to check. 9- See if you have a budget to feed said representatives. We have a local deli that makes boxed lunches for a great deal and even delivers. We buy lunch for ourselves and reps that day and get a case of waters to go with. Place this order ahead of time. 10- On the day of, set up your Chromebooks around the room and have some sort of check-in table. Sign students in on your live Google sheet (so teachers can check it if they have questions about where a student is), give them a copy of their transcript, and instruct them to find a seat. 11- If your school is big, you may want to consider printing some signage to direct college reps from where they check in to where they need to go. Send an email reminder to reps the day before (or a few days before) the event. Also have a check in and instruction sheet for them when they arrive. 12- Plan for your whole team (if you have more than just yourself) to be all hands on deck for this event all day. The more, the merrier! 13- Decorate with all of those extra pennants you've been piling up. Set up tables with all of that free college stuff you haven't known what to do with. When students finished their application(s), we encouraged them to browse and take pamphlets and college swag with them before they left. We cleaned out so much of our stuff, and it got in the hands of students-- just where it should go! 14- This year, we added a speaker and had music going all day. This actually brought a lot of fun to the event. It kept energy in the room and gave us a boost when we were tired of being on our feet all day! Here is a sample playlist you can use put on shuffle with some clean music. 16- The following day, hand write thank you notes to your college reps... especially if they're good! You want them to come back! 17- Post pictures on your school's social media. Celebrate students! Make a new bulletin board!